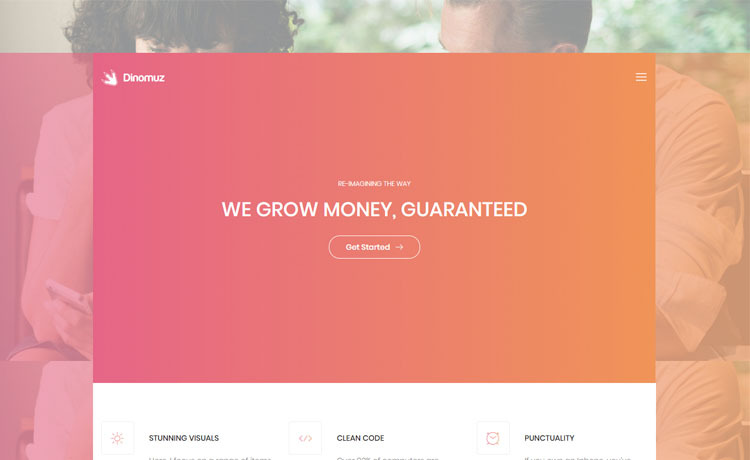 Dinomuz is a free Bootstrap 4 HTML5 landing page template. It is a multipage layout along with 20+ unique UI blocks. It has a fixed background with a gradient overlay. Service cards with on-hover effect. Dinomuz is a free Bootstrap 4 HTML5 landing page template that will work best for the creative websites you can come up with. You can create magic with Dinomuz free Bootstrap 4 landing page template. Dinomuz has stunning visuals with clean code. It is a multi-page layout along with 20+ unique UI blocks. It has a fixed background with a gradient overlay. Service cards with on-hover effect. Dinomuz comes with trendy features like burger menu, carousel, UI elements. Dinomuz has a well- commented code structure which makes it easily customizable. This free Bootstrap 4 HTML5 landing page template has an extensive documentation packed with it. So, customization will smooth like butter for even a non-coder. Hurray!! Craft with Dinomuz and explore its beauty. Thank you for downloading Dinomuz. Here are three recommended free Bootstrap 4 HTML5 landing page templates.